The p38 pathway is the third major signaling cassettes of the mitogen-activated protein kinase (MAPK) signaling pathway. It functions in the control of apoptosis and the release of cytokines by macrophages and neutrophils. The pathway takes its name from the family of p38 kinases, which are the MAPKs that interact with the final effectors. The p38 family members possess a TGY motif in the activation segment. Like JNK pathway, p38 signaling are strongly activated by environmental stresses and inflammatory cytokines. Its activation contributes to inflammation, apoptosis, cell differentiation, and cell cycle regulation. P38 kinase was found in 1993 by Brewster and his colleagues when they study the influence of hypertonic environment to fungus. Then, it was found to be exist in mammalian cells. P38 is also one of the subtype of MAPKs, similar to JNK, it is belong to stress activated protein kinase. Now there are 5 different P38 protein kinase identified, which are p38α, p38β1, p38β2, p38γ, p38δ. The distribution of these P38 kinase are different, p38α, p38β1, p38β2 are extensively existed in various of cells and tissues, while p38γ is only existed in skeletal muscle cell and p38δ is mainly existed in glandular tissue. The p38 pathway can be activated either by different receptor or by various environmental stresses such as osmotic, redox or radiation stress, for example, one of the Cdc25 enzymes activated by UV irradiation that control cell cycle progression. The primary MAPKKs for p38 modules are MKK3 and MKK6, and the MAPKKKs include MLK2 and MLK3, MEKKs, ASKs, TAK1, and TAO1 and TAO2. Important substrates in p38 signaling include the downstream kinases MK2/3, PRAK, and MSK1 and MSK2, as well as various transcription factors. The signals are transmitted by induction of a complex network of signaling molecules that often results either in activation of small GTPases such as Rac and CDC42, or sometime via interactions of adaptor proteins. These two processes then induce activation of protein kinases at either the MAP4K or directly the MAP3K tiers of the p38 cascade which are described above. This large number of MAP3K tier kinases transmit their signals to a much smaller number of MAPKKs, phosphorylating them on Ser and Thr residues at the typical Ser-Xaa-Ala-Xaa-Ser/Thr motif in their activation loop. The main MAPKK of the p38 cascade are MKK6 and MKK3. The next tier of the cascade is composed of several p38 kinases which are all activated by phosphorylation of the Tyr and Thr residues in the Thr-Gly- Tyr motif in their activation loop. Once these p38s are activated, they either transmit the signal to the MAPKAPK level components MAPKAPK2, MAPKAPK3, MNK1/2, MSK1/2, and MK5/PARK, or phosphorylate regulatory molecules such as PLA2, heat shock proteins, the transcription factors ATF2, ELK1, CHOP, MEF2C, and more. p38 MAPK controls progression of myoblasts differentiation at multiple levels: transcription factor activity, chromatin remodeling and turnover of mRNAs encoding certain regulators of muscle differentiation. Another role for p38α that was first elucidated is its involvement in chemotactic cell migration. Most investigations on the role of p38α in cell migration have focused on links with the cytoskeleton rather than changes in gene expression. p38 MAPK activity is mainly controlled by phosphorylation–dephosphorylation mechanisms, but a number of additional regulatory mechanisms have been also reported. The canonical p38 MAPK-activation pathway involves MAP2Kcatalysed phosphorylation of threonine and tyrosine residues in the activation loop. However, non-canonical mechanisms of p38α activation have been also described. One is apparently specific to antigen receptor that leads to p38α auto phosphorylation on the activation loop and, as a consequence, increases its kinase activity towards substrates. An additional alternative pathway of p38α activation involves TAB1 (TAK1-binding protein 1), which can bind to p38α, but not to other p38 MAPK family members, and induces p38α auto phosphorylation in the activation loop. Down-regulation of p38 MAPKs is critical to achieve transient activation and to regulate signal intensity, which in turn results in specific outcomes. Termination of the kinase catalytic activity involves the activity of several phosphatases that target the activation loop threonine and tyrosine residues, including generic phosphatases that dephosphorylate serine/threonine residues, such as PP2A and PP2C, or tyrosine residues, such as STEP (striatal enriched tyrosine phosphatase), HePTP (hemopoietin tyrosine phosphatase) and PTP-SL (protein tyrosine phosphatase SL). The activity of MAPKs can be also regulated by a family of DUSPs (dual-specificity phosphatases) which dephosphorylate both phosphotyrosine and phosphothreonine residues. The organization of MAPK cascades involves binary interactions between the kinases as well as scaffolding proteins that interact simultaneously with several components. One of the p38 MAPK scaffolds is OSM (osmosensing scaffold for MEKK3), which forms a complex with Rac, MEKK3 and MKK3, and regulates p38α activation in response to osmotic shock. In addition, the JIP (JNK-interacting protein) family members JIP2 and JIP4 have been reported to regulate p38MAPK activation. The regulation of the p38 MAPK pathway and its functions in vivo are shown in figure 1. Most of the studies have focused on p38α, establishing its implication in tissue homoeostasis and several pathologies from inflammation and the immune response to cancer, heart and neurodegenerative diseases. A strong link has been established between the p38 pathway and inflammation. The activation of the p38 pathway plays essential roles in the production of pro-inflammatory cytokines (IL-1β, TNF-α and IL-6). Abundant evidence for p38 involvement in apoptosis exists to date and is based on concomitant activation of p38 and apoptosis induced by a variety of agents such as NGF withdrawal and Fas ligation. Overexpression of p38 in yeast led to significant slowing of proliferation while treatment in mammalian cells with p38α/β inhibitor SB203580 slowed proliferation as well. p38 has been implicated in G1 and G2/M phases of the cell cycle in several reports. Figure 1. 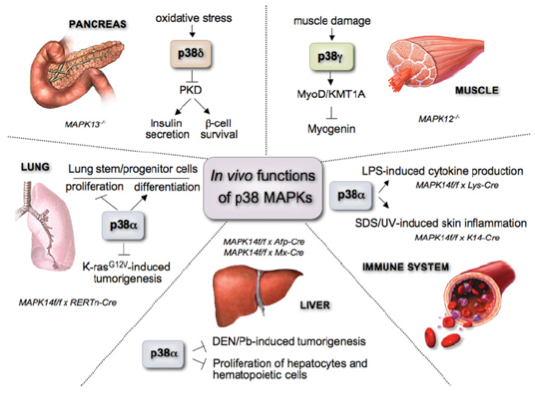 In vivo functions of the different p38 MAPK family members. 1. Mittelstadt P R, Salvador J M, Fornace, Jr A J, et al. Activating p38 MAPK: new tricks for an old kinase[J]. Cell Cycle, 2005, 4(9): 1189-1192. 2. Cuenda A, Rousseau S. p38 MAP-kinases pathway regulation, function and role in human diseases[J]. Biochimica et Biophysica Acta (BBA)-Molecular Cell Research, 2007, 1773(8): 1358-1375. 3. Huang G, Shi L Z, Chi H. Regulation of JNK and p38 MAPK in the immune system: signal integration, propagation and termination[J]. Cytokine, 2009, 48(3): 161-169. 4. Cuadrado A, Nebreda A R. Mechanisms and functions of p38 MAPK signalling[J]. Biochemical Journal, 2010, 429(3): 403-417. 5. Cuadrado A, Nebreda A R. Mechanisms and functions of p38 MAPK signalling[J]. Biochemical Journal, 2010, 429(3): 403-417.